FC Barcelona will play OGC Nice, also known as Olympique Nice, on Saturday 2 August in the second preseason friendly to be confirmed. The venue will be the recently completed Allianz Riviera with the capacity for 35,624 spectators. FC Barcelona and OGC Nice have not played each other since they met for the first time in the 1973-74 UEFA Cup. The Côte d’Azur based outfit won the first leg 3-0 at their former home, the Stade du Ray, and progressed to the second round despìte a 2-0 defeat in the return leg at the Camp Nou. OGC Nice played their first game at their new stadium, the Allianz Riviera, one of the most ecological venues in the world, on September 23, 2013. The friendly with Barça will be the second international match to be staged there after it was used by the French national team for a World Cup warm-up match against Paraguay on June 1. 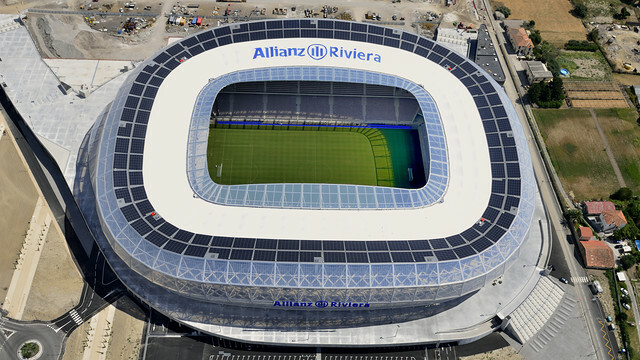 The Allianz Riviera not only shares a sponsor with Bayern Munich’s Allianz Arena, but is also strikingly similar in its structure. Founded in 1904, OGC Nice’s biggest honours are four French League titles and three French Cups. They are currently one of the 20 clubs in the national top flight, Ligue 1, which will get under way one week after the friendly with FC Barcelona. Tickets for the game between FC Barcelona and OGC Nice will be available from Monday 16 June at 2.00 PM CET, and will be selling from 25 euros. They can be purchased from the stadium website at www.allianz-riviera.fr, from Carrefour stores, the official Allianz Riviera supplier, and all of the other usual sales channels. OGC Nice is Barça’s second confirmed opponent for the forthcoming preseason after it was announced on May 23 that the first team will play a friendly against HJK Helsinki on August 9.